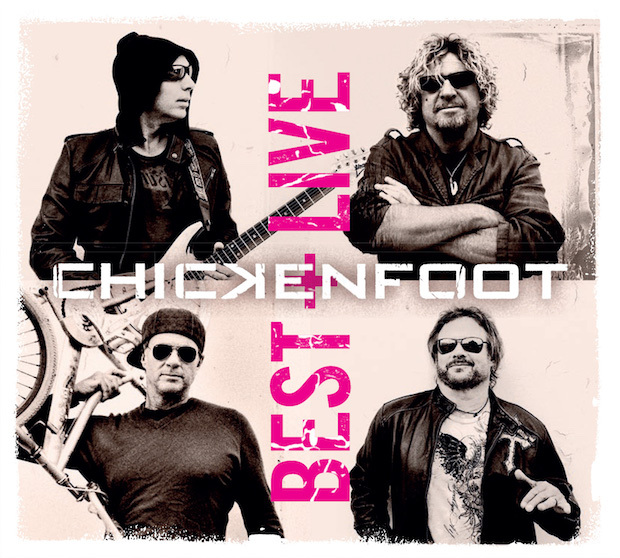 Chickenfoot's new release BEST + LIVE (coming March 10, 2017) features the band's first new tune in 5 years. The new track “Divine Termination” opens up the group’s first ever best of collection. In addition to “Divine Termination,” BEST + LIVE includes over 90 minutes of live music – for the first time released on CD. Sammy Hagar says, "Listening to this collection of songs from the ‘Foot brings back memories of some of the most fun I've ever had in a band. The chemistry between Chad, Joe, Mike and me is very special. It's almost like visual music -- you can see us having fun when you listen to these songs." In May 2016, Chickenfoot reunited for two highly-anticipated one-time shows at Harrah's Lake Tahoe, and played their first complete set in more than six years, along with a special unveiling of the new tune "Divine Termination." Joe Satriani describes the track as "bone crunching, hell raising rock, dripping with attitude and vibe. Just the way Chickenfoot likes it!" Both the extra CD “LIVE” and the bonus tracks on the best of feature a 13 song strong set list including almost every song from Chickenfoot’s debut album as well as Sammy Hagar’s old Montrose classic “Bad Motor Scooter,” The Who’s “My Generation” and Joe Satriani’s interpretation of “The Star Spangled Banner" – all recorded live in Phoenix 2009 and available for the first time on CD (previously only available as video on the DVD/Blu-ray "Get Your Buzz On." The group’s last album, Chickenfoot III, debuted at #9 on the Billboard 200 when it was released in 2011. Release Date: Friday, March 10th, 2017 by eOne Music in North America and earMUSIC/Edel around the world.